There are now at least five women in the Wiener Philharmoniker. Riccardo Chailly and the Gewandhausorchester Leipzig played Mahler 9 on Saturday to great effect. The maestro was very pleased. I got back to my hotel after in time to see the final credits roll on Don Carlo on the ORF. 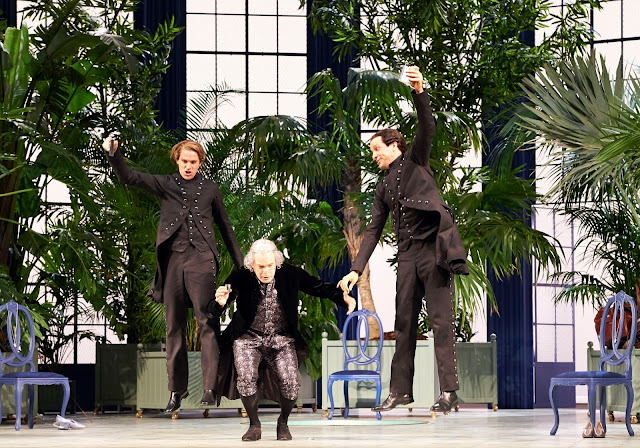 The seats in both houses of the Salzburger Festspiele are very uncomfortable, especially in long works like Meistersinger. Tried Kaiserschmarrn today and liked it. When in Austria, do as the Austrians do. Lotfi Mansouri has died. He was formerly head of the San Francisco Opera. His obituaries are saying he invented supertitles. I didn't know that. 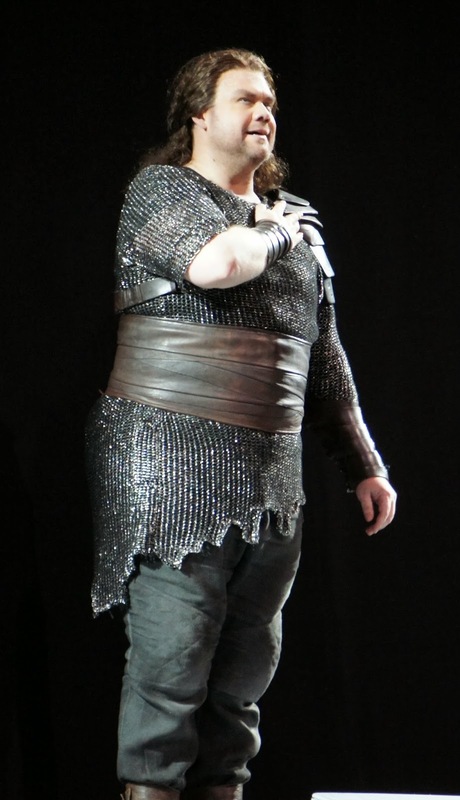 I no sooner said that Eva-Maria Westbroek was ready for something bigger than I found she is scheduled to do Isolde in Bayreuth in 2015. I came for this, of course. I wanted to experience the Norma at Salzburg for myself. Now Cecilia Bartoli is talking about taking it on the road, so look for it in a theater near you. I saw Norma once with Sutherland and Horne in San Francisco. They mostly just stood around and sang. It was very beautiful, mind you, but it could have been a concert. Cecilia's Norma--what else can you call it?--is sort of the opposite. Norma is the leader, the sacred object, the chaste priestess, the leader of men, the leader for peace in a crowd of people who want war. This is a modern dress production. My theory of modern dress holds here. Dressing the actors like people we know makes them feel to us like people we know, makes their loves and hates feel like our own. Then their leader whom even her father loves and follows, turns out to have been living a lie. Instead of chastity, she reveals first to Adalgisa and later to everyone else that she has been the lover of the proconsul and has had two children by him. Once she knows that Norma has been with Pollione, Adalgisa wants nothing more to do with him and fades from the story. She's there mainly for duets. In this production all the cuts are restored. The opera doesn't seem that long to me so it's hard to see why cuts were necessary. Orchestrally the bel canto was a period of transition. New instruments were invented and moved gradually into general use. Cecilia has chosen to move unambiguously back to an antique instrument ensemble. She confesses. It is a role waiting to be discovered. I felt that this production by Mosche Leiser and Patrice Caurier completely worked. Every concept was theatrically viable, involving, even jolting. 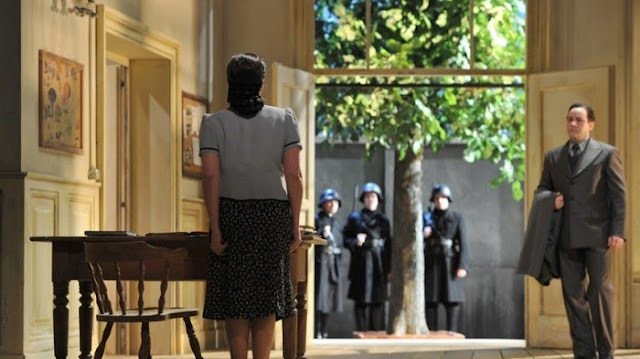 "Guerra" shouted at us from the front of the stage was particularly thrilling. 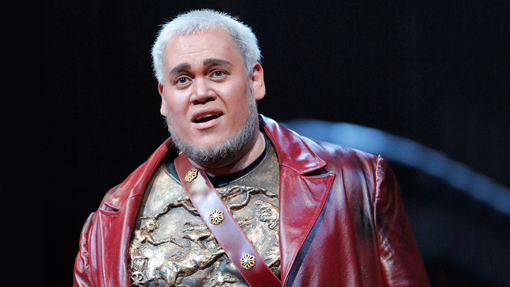 Michele Pertusi as Norma's father Oroveso has sung with Cecilia since her early Cenerentola recording. He is always strong vocally and theatrically. 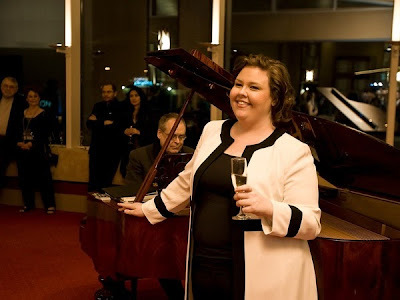 Liliana Nikiteanu is another long time colleague of Cecilia's from the Zurich Opera. John Osborn appeared with her in Rossini's Otello. Only Rebeca Olvera is new. 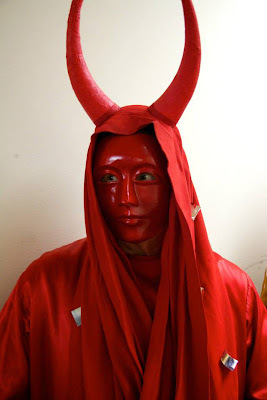 She is a member of the Zurich ensemble. They are a strong cast. 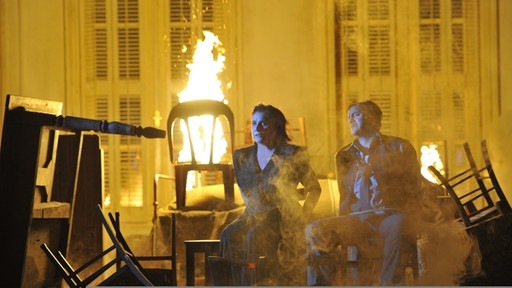 But this is Cecilia Bartoli's production, and it rises and falls with her. 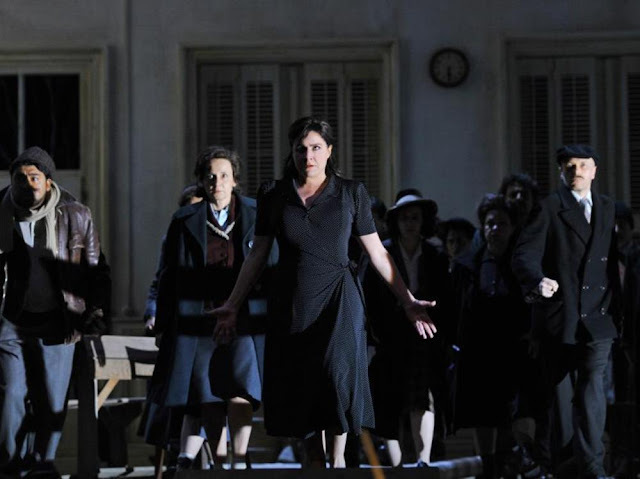 This marvelous theatrical concept requires Cecilia Bartoli to bring to success. She is attempting nothing less than the complete recreation of Anna Magnani, the passionate Italian actress. The result is more like Broadway than opera, because the emphasis shifts to the action, and no one sings dramatic recitative better than Cecilia. The strength of characterization is powerful well beyond the normal confines of opera, but vocally it is less than a perfect fit for her. The character of Norma disintegrates into drunkenness at one point. At the end Pollione calls her a "sublime woman." Yes. I can say nothing more. I am with a group here and have a lot of opportunity to talk about opera. Those of us who have been watching opera a long time have had the opportunity to see the operas presented as they are originally intended. But if you are new to the opera, how would you know that Snow White and the Seven Drarfs do not normally appear in Die Meistersinger? How would you know that it isn't supposed to be a dream? How would you know that Don Alfonso doesn't normally die of poison at the end of Cosi? I am hearing a lot of confusion. Why did that happen? The only possible answer is Who knows? Sometimes the stars align. Sometimes the musical phrasing is so strong that everyone is swept up in the experience. Sometimes perfection is achieved. Yesterday's concert was such a time. The Wiener Philharmoniker with Lorin Maazel was on the program. I enjoyed the sweet playing of the Siegfried Idyll which began the concert, but it's not really one of my favorites. The joy for me came in the second half with a performance of Act I of Die Walküre. I did not mind the absence of surtitles because by now I am very familiar with this act and recognize just enough German. I saw Eva-Maria in this role in New York and San Francisco, but was unprepared for how truly wonderful she was here. The voice was big and glorious and for my ears ready to take on something more. She was the only one who did not use a score and attempted to act her part as she would on the stage. Peter Seiffert, the true Heldentenor, perhaps the Heldentenor of our time, was completely on form. I saw him before in Tannhäuser in San Francisco, and he was very passionate and warm here. Matti Salminen is a force of nature. He provided just the right amount of terror in the awkward situation that is the beginning of Walküre. 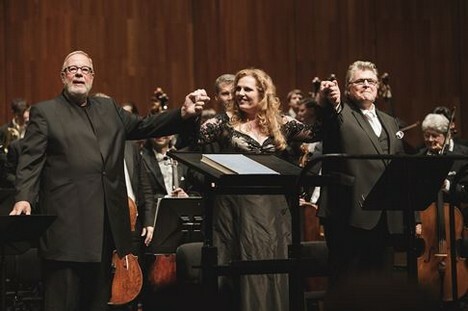 Such musical synchronicity among the three singers was met and exceeded by the synchronicity with this great orchestra and the musical leadership of Lorin Maazel. They started quietly and built steadily over the long act. Everyone was ready when the big finish came. Great singing, great playing, great music. Keep your heart open and something wonderful will come your way. 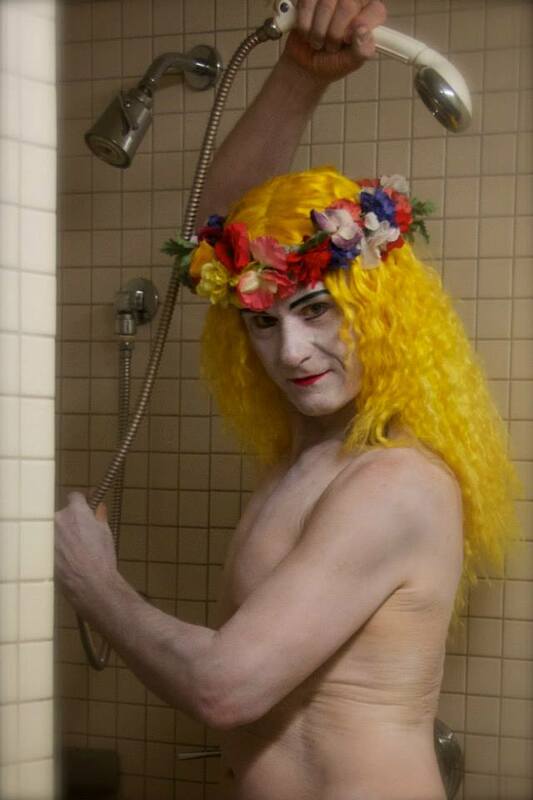 Perhaps it was too soon for me to see another Cosi fan tutte. I think if you get enough opera lovers together, everything will find someone to dislikes it. We used to say "Gesmacksache!" So I will just tell the things I liked. The Despina of Martina Jankova was fresh and entertaining. I don't know why I never noticed this before, but Don Alfonso only wins because he cheats by persuading Despina to do all the work for him. The set was a giant spa with a bath in the center and palm trees all around. In the second act the bath is covered and the palms move outside. This was a very conservative production, but still someone wanted to know "Why?" Both of our baritones, Luca Pisaroni as Guglielmo and Gerald Finley as Don Alfonso, were excellent. Christoph Eschenbach conducted some outstanding ensembles, the key to a successful Cosi. Our audience was very pleased, with sustained rhythmic clapping that went on for a long time. The disguises were lame, as usual. This time Ferrando gets Fiordiligi and Guglielmo rejects Dorabella, the consolation prize. Don Alfonzo drinks poison and dies. There's a lot to be explained here. How about Fiordiligi goes to Ferrando and Guglielmo stabs him? Wouldn't that make more sense? I bought a program for Cosi and it lists the casts of every performance of Cosi at the Salzburg Festival. It makes for some fascinating reading. 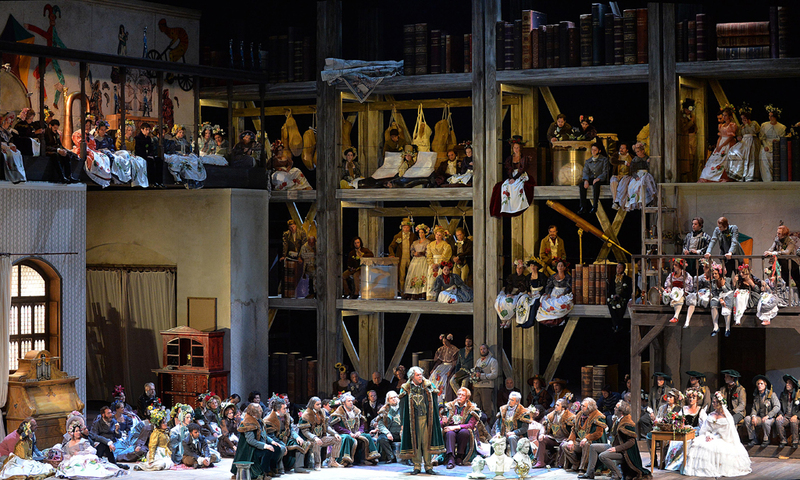 The production of Die Meistersinger von Nürnberg at the Salzburg Festival takes place in Hans Sachs's mind. I can reach no other conclusion. He clearly loves Eva very much and then imagines a young knight for her to marry. If you came to this version from the Bayreuth version, as I recently have (see here), you might wonder what opera you were seeing. This version is much more traditional. Only one bit I liked better in the Bayreuth version--when Walther rejects the Meister robes, in Bayreuth he has just signed for millions to become a rock star. Here he just thinks he's too good for it. This provides Sachs with the opportunity to praise German art. The story doesn't really emphasize Sachs until the middle of the second act. Have I imagined the opening scene is usually cut? Sachs, sung by Michael Volle, is everything here. He laughs. He cries. He falls down in terror or in sorrow. He embraces his Eva and then gives her away to another. I have tried to imagine this production without Michael and simply cannot. He receives the highest accolade--I have simply never before cried at Meistersinger. The first scene of the third act was especially intense. So it is Sachs himself who imagines the glorious song that wins the prize. Doesn't that make more sense? Roberto Sacca as Walther sang the prize song well, but was not so good elsewhere. I still remember him as a lyric tenor. If we are to make him a blond, he could perhaps have bigger hair. Anna Gabler as Eva was beautiful and very passionate. The audience booed Daniele Gatti, the conductor, and the mediocre-sounding orchestra by implication. Since I am more inclined to like Meistersinger, I would consider it a flaw that the music did not sound as I expected. But my heart was only for Michael. See. I told you Spearhead News has all the best pictures. This will be the Vier letzte Lieder by Richard Strauss in the world premier performance with Kirsten Flagstad and Wilhelm Furtwaengler. I am posting this because I notice my contemporary singers are running way ahead of my classic singers. This song set is performed in various sequences, but this is correct for this particular live performance. It is my understanding that the publisher has arranged them differently. Kirsten Flagstad was not Strauss' ideal voice, but he did nevertheless compose them for her. The condition of the recordings is terrible. I mean really terrible. She is supposed to be terrible, past her prime, too heavy for the part, yadayada. I can't hear it. This is exactly what I would want. The pieces are established forever in this performance. Flagstad was an extraordinary singer who never came even marginally close to over singing, so here at 55 she sounds very much herself to me. The later Tristan recording was very much messed with, but this is live. She never sang Fruhling again. She found truth through simplicity. For those who truly love her she towers over everyone. 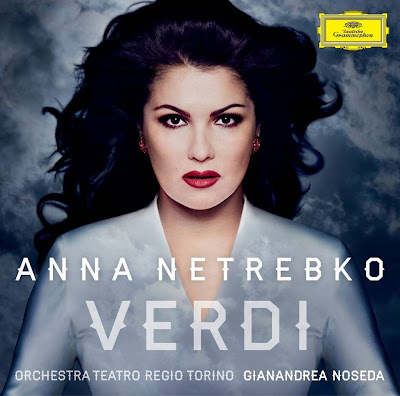 "Anna Netrebko - Verdi is the first album in history by a female classical singer to hit #1 on the Austrian pop charts, and is also #6 in Germany, #8 in Denmark, and #1 on Russian iTunes!" Perhaps my opinion is not really relevant, but I will say a few words. The sound of her voice at this point is very pleasing. Of course, with Netrebko you don't get the full experience without the acting, but nevertheless it is a very impressive recording. She is at her peak now. I don't know that I agree with her that she shouldn't sing La Contessa, though. It's nice to see this much excitement over an opera singer. I was raised on this. Leontyne Price was the greatest Verdi singer that ever lived, and she wails this like no one else. Watch how relaxed she is in her body when she sings. The energy all goes into the phrase. Karajan loved her and said she gave him goosebumps. But I like to hear new things, new voices, new phrasing. They are not required to top Ms Price because no one ever will. I notice the more I blog about music the more love I feel, both for the music and for the artists making it. The new Barenboim recording has soloists that all come from Germany and Latvia, singers who feel it differently. I don't require other singer's to top Leontyne Price, but could they please try to wail just a bit now and then. This is Renata Scotto, and she definitely wails. I just received my copy of Opera News, and they say that we are living in the Age of Netrebko. You will please note that I called it the Age of Netrebko in 2009. We here on the west coast of the US have been fans for ages. Viva Anna. I did like the part where they called her personality "benign mania." Her personality is big like a pop star. 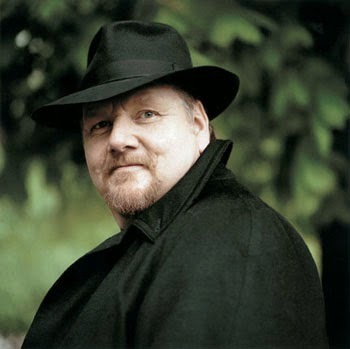 This is Piotr Beczala singing Lensky's aria from Eugene Onegin. This is my usual translation of an interview here. Jump over to the article to see the pictures. Anna Netrebko: "I always listen to my voice" The Star soprano about Lady Macbeth, her change of voice category, her plans and her small, big luck. She need not sing, and would still be one of the absolute stars of the Salzburg Festival 2013: Anna Netrebko. There is hardly an opera premiere on the river Salzach in which the Russian soprano with Austrian citizenship is not in the center - if only as an interested listener. If she also sings, already general rapture is announced. That was so at three concert performances of Verdi's "Giovanna d'Arco", after which Netrebko was celebrated alongside opera legend Plácido Domingo. And it will probably be like that even today, Sunday, with Britten's "War Requiem". In KURIER interview the diva speaks without airs on professional and personal happiness as well as new challenges. KURIER: With the concert performance of Verdi's "Giovanna d'Arco" you celebrated an incredible success. Why was the opera not staged? Anna Netrebko: "Giovanna d'Arco" is musically magnificent, and the role very much suits my voice. But the story - well. A woman suddenly hears some kind of voices, goes to war and becomes a martyr, even a saint. That's total nonsense! You do not need to stage everything. Above all, this album will be a tribute to one of the greatest composers of all time, suitable for Verdi's 200th Birthday. But it's true: My voice has changed radically lately. It has become darker, fuller, more dramatic - I encounter this in Verdi. 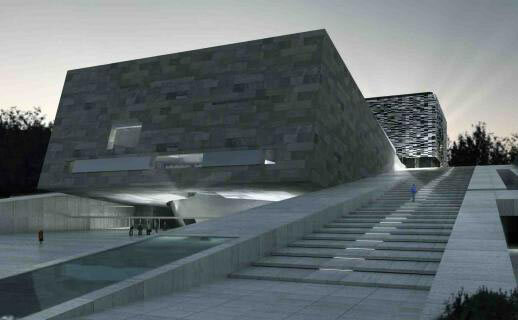 I want to conquer this Fach. Now is the perfect time for it. Therefore, I will also make my debut as Lady Macbeth in Munich in 2014. But that is staged, because I can live her myself, I can identify with that role myself. You can identify with the Lady Macbeth? But of course! This is a very strong woman who knows what she wants. That they go for their goals over dead bodies is not okay. But she suffers the consequences - even to madness. I like on the opera stage as in real life exciting characters. Just as Leonora in "Il Trovatore", that I will sing for the first time. Other Verdi roles do not interest me, even if I could sing them. A Desdemona like in "Otello" I definitely do not want to play. What kind of a stupid woman is she? 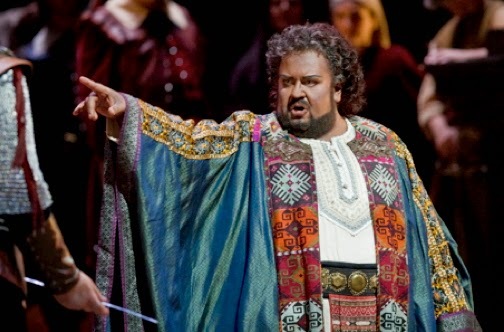 If I have such a jealous macho man as Otello at my side, I separate myself from him immediately. And that's that. I live as Desdemona, and he should do what he wants. This of course does not alter the fact that both the Shakespearean drama and Boito's libretto and Verdi's music are fantastic. But that's not the type of woman that I want to represent on the stage. The same is true for the Lady Macbeth of Mtsensk by Shostakovich. I would never be stupid enough to go into the water for a man! Yes, a gorgeous, touching work. I am pleased to make it with Antonio Pappano, Orchestra of Santa Cecilia and colleagues like Thomas Hampson or Ian Bostridge. After all, in 2013 we celebrate not only Verdi and Wagner, but also Britten's 100th birthday. This is such an important performance. Also, I love Britten. This music is something serious and gets under your skin. In this Fach I would like to get a taste of a lot more, but I do professionally already so many crazy things. Daniel Barenboim has talked me into a very wild project. I will release the "Four Last Songs" by Richard Strauss on CD. An incredible undertaking. I and Strauss! But Daniel said: "Anna, that is exactly right for you, you can do it," If Daniel wants something and he will propose a project to me, I can only agree. I trust him absolutely. But it is hard work. Since it is less about the language itself, rather than the idiom, the emphasis of individual words or syllables. I study Strauss intensively and hope that I can also meet him eventually. Maybe one day even on the opera stage? Why not? But for that I must be quite sure that this is the right role in the right constellation and the absolute right time for me. The music industry has become so fast that you often barely keep up. I have to sign contracts for years in the future and don't even have a clue how my voice will sound, if it is still right for that role or any role. Yes, not only for me, for us all. How to give our best every day, because people simply expect this when they buy tickets. And they are quite right. On the other hand it holds great dangers. Vocally one should not be too quick to drive into any adventure. This can backfire. In addition to all this, you need a balance, a family, friends. 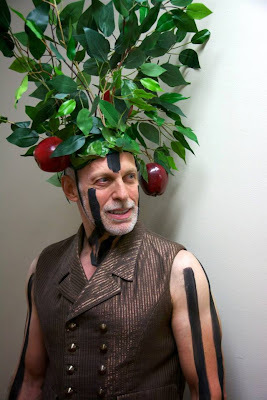 You are romantically involved with the famous bass-baritone Erwin Schrott, who with one son Tiago, your private life is constantly exposed to the public. Each of your steps is interpreted in one direction or another. How do you deal with it? This is unfortunately so. Work is just work, but private life is private life. I create my free time. I'm very happy with Tiago in Vienna in the Zoo. He loves this, we look at the animals for hours, and no one recognizes us. Because we are there just mother and son. This is for me a small, very big happiness. But with this also come responsibilities, like various kinds of housework. I learn a lot from Tiago. I enjoy that, because I am not Anna Netrebko, but a mother with everyday worries and troubles. You have made Vienna the center of your life. The best decision! At the Vienna State Opera, where next season I again sing Marguerite in Gounod's "Faust", I'm home. Vienna is pure music. The daily interaction is incredible. And Vienna is a city where I can breathe, where I can just be me - Anna Netrebko. Recently these photographs of the New Florence Opera House or Nuovo Teatro dell'Opera di Firenze appeared in the press, including Opera News. 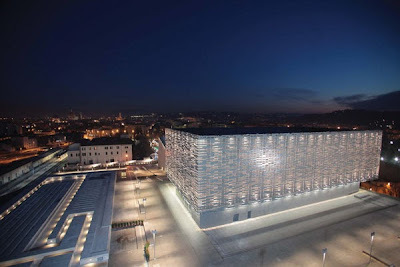 The opening took place on December 21, 2011. 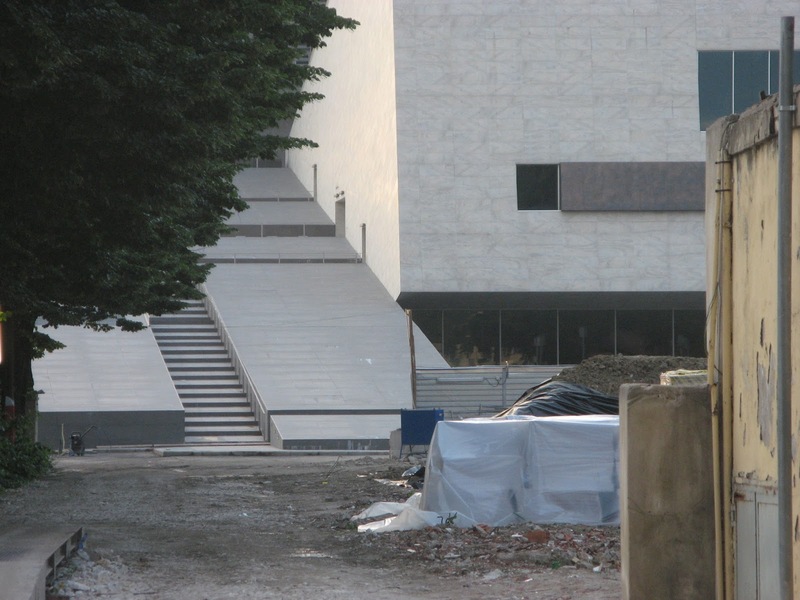 My friend Rona Commins was in Florence in May and made a point of searching for the new opera house. Here is what she found. It looks like a derelict construction site. 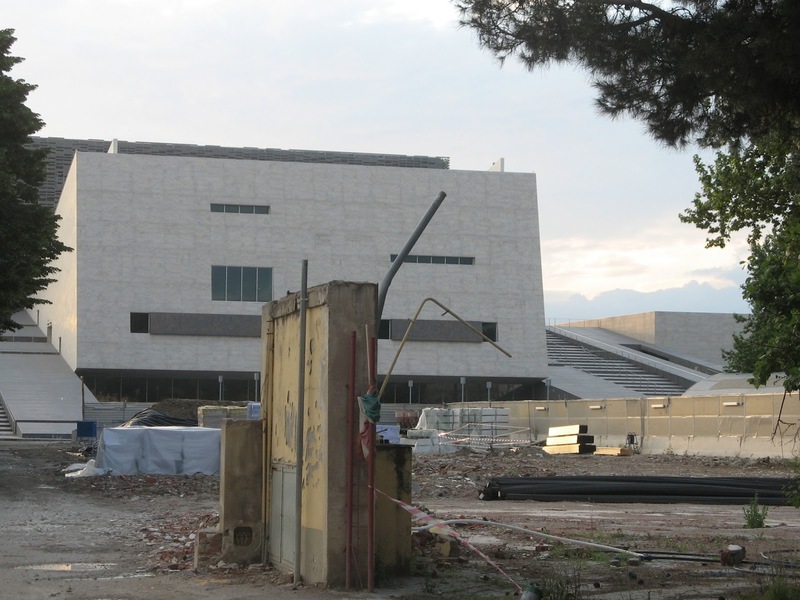 Things are dire for the arts in Italy now, and the flow of money seems simply to have halted. No subsequent performances have taken place in the house. The Florence spring festival Maggio Musicale seems to have gone on but hardly as usual. Operas were presented in the old house in concert versions only. The ballet has been disbanded. In a week I will be traveling to Salzburg for the last week of the festival, but since my tour didn't include Verdi's Don Carlo, I thought medici.tv was the way to go. I forgot that the live streams don't include subtitles. If and when the stream reappears as a film on medici.tv, subtitles will undoubtedly be added. What an astounding cast. Eric Halfvarson was the only repeat from the Met simulcast. This performance is above all a masterpiece of casting. Pereira knows all of them from Zurich. And Pappano and the staff bring each of them to the peak of intensity. I am feeling numb and speechless. The opera is about politics. The Catholic Spain has conquered Protestant Flanders and is ruling it with an iron hand. The Inquisition is merciless against them. Philip II shows his bias in his friendship with the Grand Inquisitor. Carlo and Rodrigo band together to speak for the side of Protestant freedom. 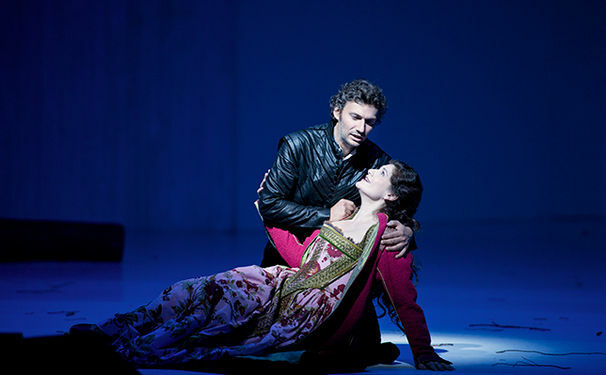 There is a wonderful duet with Hampson and Kaufmann where they sing of their friendship. They are marvelous together. Hampson is vocally and emotionally just right for Rodrigo. He projects a certain softness that is very much the character of Rodrigo. Their defense of the people of Flanders has no effect. Rodrigo argues for Carlo as governor of Flanders. All is a failure, and the prisoners are burned on the stage. 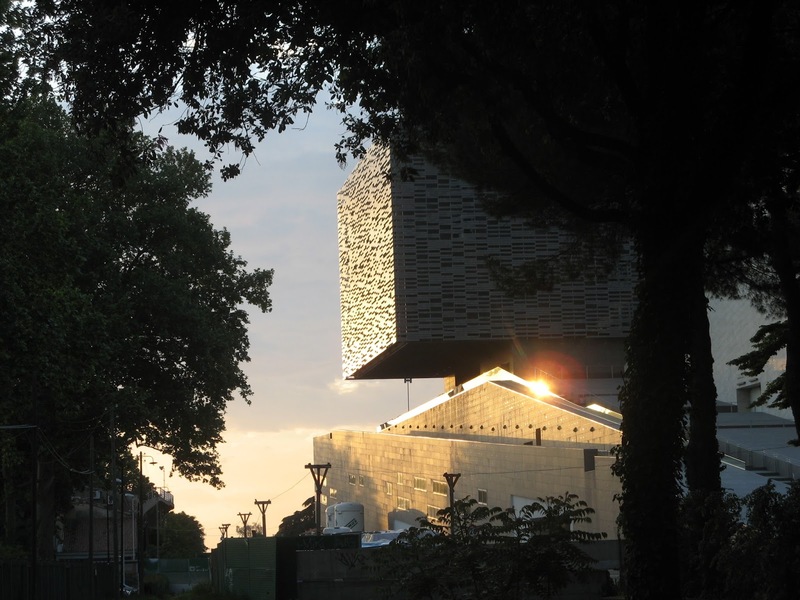 The opera is about the conflict between love and duty. Carlo and Elisabeth meet in the forest in France and fall in love when they realize they are destined to marry. Then politics changes everything--Elisabeth marries Philip II instead. She accepts this reversal of fortune much better than he. 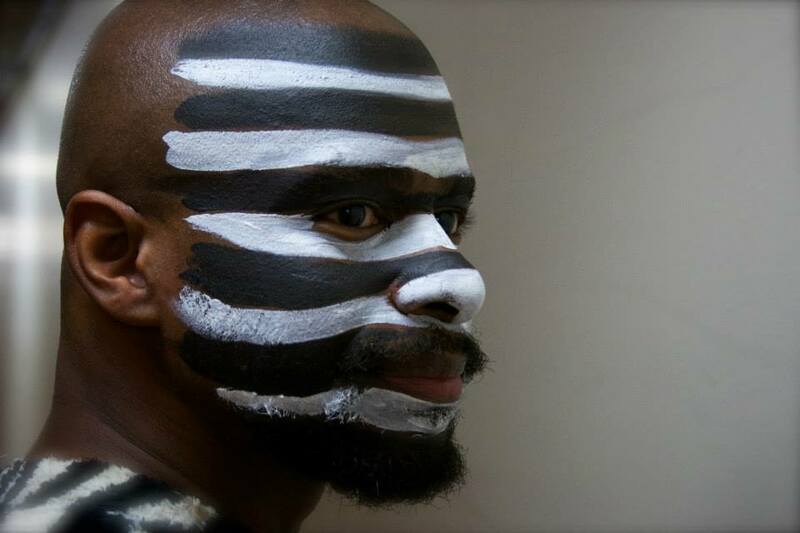 Carlo is a role that consists primarily of duets. Kaufmann is by now very much accustomed to singing with Harteros. Both sing big which is exactly right for Verdi. And both can. To be completely honest, he is working a lot harder at it than she is. Her voice simply is that big. They bring an almost magical balance of voice, stature and emotion when they work together. When Rodrigo finds out that Carlo is in love with Elisabeth, he betrays him. The plot is not the same without this betrayal which I simply cannot understand. Why would he do this? When the betrayal brings him the favor of Philip, he refuses it. When Carlo is imprisoned, Rodrigo says he will die for him, and then actually does. More beautiful duets. This is exactly how I want my Verdi. My dears, this is what it is about. 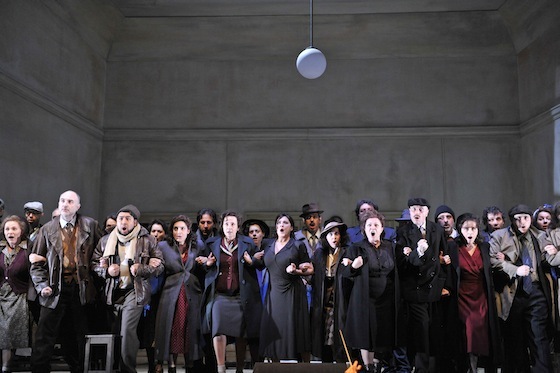 What makes a great opera? Those people you see standing there. Their voices, their bodies, their souls, their hearts. A production that explains what they are doing there together and never distracts you from them. And Verdi. Why do the Italians adore him so? Because the best Verdi is the best anything. With this cast and this conductor it had an intensity and excitement that I have rarely seen in my years as an opera goer. My sense of this opera is transformed. In an interview with ARD in the program "ttt" for the first time the singer [Netrebko] commented on her private life. "I have responsibility. For my family, for my son," she said. "And it depends on me to organize everything and prepare. They asked me if I was relaxed - no! Something is really wrong in my life: I work too much. And that's my fault. Not the manager. Only mine. I'm doing too many things." There's so much opera news right now it is hard to keep up with it. Montserrat Caballé is now persona non grata in Azerbaijan for visiting the Armenian separatist enclave. 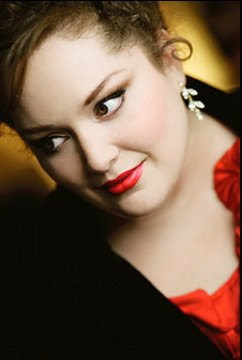 Elīna Garanča is pregnant and has withdrawn from Werther at the Met. Sophie Koch will replace her. Anna Netrebko continues to be hounded for being personally acquainted with Vladimir Putin, as though knowing someone made you responsible for the entire government. I remember the Austrians didn't like it that she campaigned for Putin because they expected her to act like an Austrian. An Austrian does not campaign in Russia. I prefer the idea of taking action against Putin for things Putin does. Picket him. Throw him out of things. How about if every time we invaded someone, they threw our American singers out of their performances? For me music isn't about politics. Alle Menschen werden Brueder. That's our politics. It was recently announced that Roberto Alagna is now with the Polish soprano Alexandra Kurzak and they are expecting a baby. The great mezzo-soprano Regina Resnik has died. 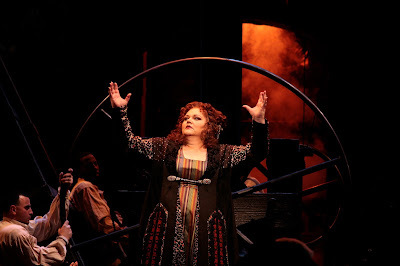 Angela will sing a couple of performances of Norma at the Met this fall. 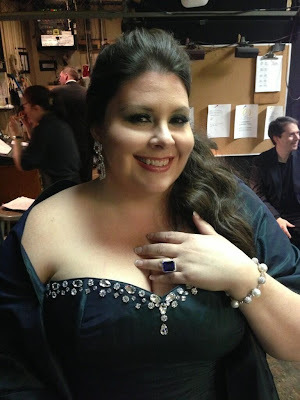 Heidi made her proms debut this summer as Elisabeth in Tannhäuser. Jamie will be singing Adalgisa to Angela Meade's Norma. They aren't switching the parts like Cecilia Bartoli. Leah was at the Arena di Verona singing Leonora in Il Trovatore. Stephanie is in the Seattle Ring. 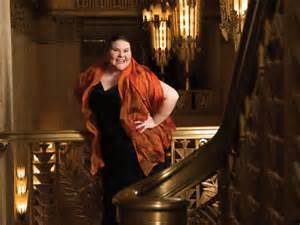 Meredith will be in San Francisco for Falstaff this fall. Karen recently appeared in Dead Man Walking. She knows how to do a glamor shot. 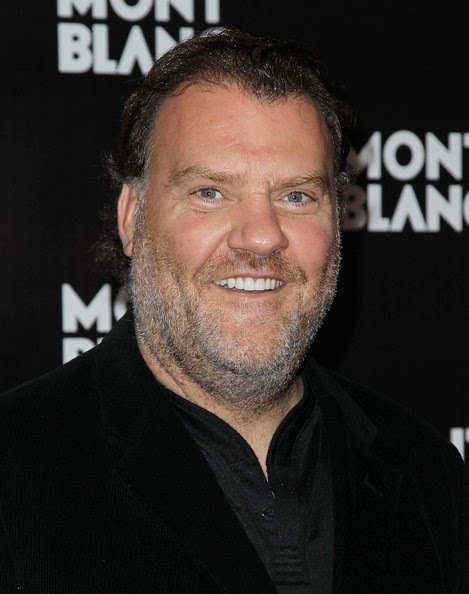 I saw a post today about the 10 hottest plus sized celebrities, and it occurred to me that I was long overdue for an opera list. I've heard all of these women and find them to be excellent. Forgive me if I missed anything. In the wake of Taragate it occurs to me that I neglected to include any men in my plus size singers item. I deeply apologize. Quinn Kelsey who is in La Traviata in San Francisco. Stuart is the Opera male singer of the year. Sample of the new Barenboim Verdi Requiem featuring Anja Harteros. Modern bel canto singing starts with Callas. This role was written for Giuditta Pasta, a singer who is now considered a mezzo. Perhaps it validates my opinion that Callas was also a mezzo. The aria only goes up to an A, and already she shows a wobble. Overall this is an outstanding performance with great simplicity. Gruberova does more with the rhythm than anyone of this group. The army of commenters all seem to want to critique the sound of the singers' voices. They never say what they like. They just trash the one you're hearing. I'm far more interested in the style and like Gruberova more here than some other places. She is a very creative artist. She has announced her departure from the Bavarian State Opera because they don't use her much now. She would like to continue singing. Begin 4:20. From the comments I begin to believe that those who make nasty cracks like voices no heavier than Caballe. This is elegant and sweet. No one would mistake her for a mezzo. Of course, if you sit around reading YouTube comments, you know that someone will mistake anything. If Pasta was a mezzo, she might have sounded more like Trebs than most of the other ladies. 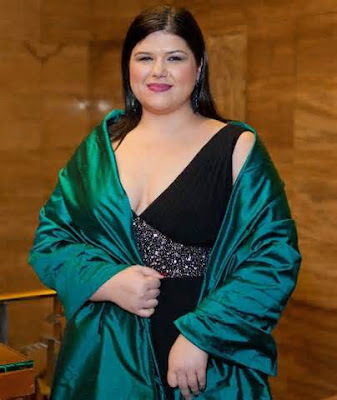 This is Netrebko after the baby, and my sense of this is that she is struggling with her new voice. Begin 4:08. 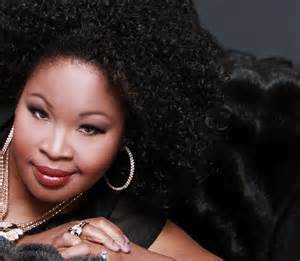 For my ears Angela is one of the most stylish singers that ever existed. No one slides better. She draws me, but also has quite a light voice. This is just for fun. Everyone has their opinions. After reading the latest study, perhaps the supercritics all live in Louisiana and Texas. The most favorable ratings seem always to go to the most boring performances. What fun is that? When I decided to receive Google Alerts in German, I had no idea what I was getting into. Apparently, Anna Netrebko and Erwin Schrott are the Brad and Angelina of the German speaking world. There is an endless stream of gossip. In a video interview Anna was asked if she could be anyone, who would it be. She responded, "Someone not famous." Anna would prefer an ordinary life. This is sad. It is mentioned occasionally that they are also working, but that is not the true interest. He is touring as a tango singer, something very dear to his South American heart, while she is learning new roles and recording a new album.